From the moment I found our house plans I began thinking about the kitchen. I have an affinity for country French styling but don’t always love intense distressing and it can also can be too fancy, smancy looking for my taste as well. Our house is a craftsman by definition, but has some softer features and more neutral colors than many I have seen. I love mixing in industrial metal features so all in all I would call my style industrial farmhouse. I love white cabinets and they photogrpah just beautifully but sometimes white on white feels somewhat clinical in real life. When I picked our cabinet color I actually thought it would be even more gray! See how it looks different?! I was considering painting them darker when I first saw the true color but then decided it may be a good inbetween- not too white – not too gray. I absolutely love how it all turned out together so I’m glad I took the chance on something a little different. It’s always a good choice to see paint colors in your natural light before making a final decision. The backsplash was hard I knew I wanted white and there would have been many options that would all look good in here but this tile adds elegance a simple white subway tile can’t. 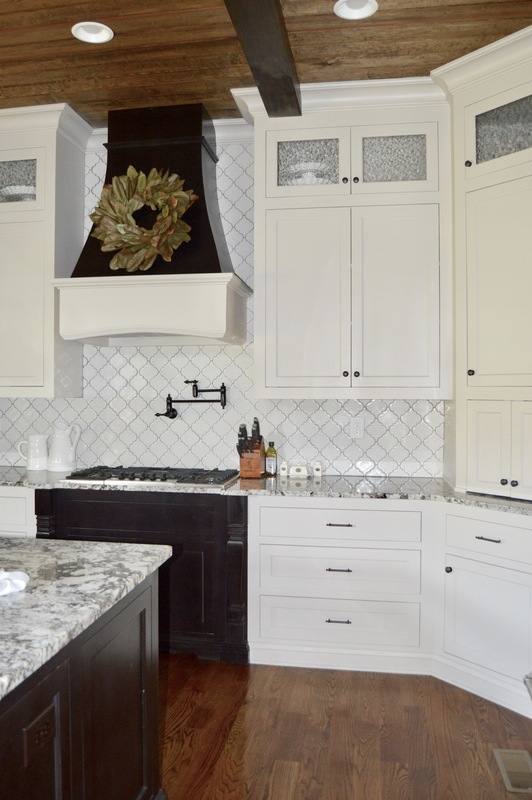 We considered doing a Carrerra marble subway tile but then found this arabesque tile that was just beautiful with the cabinet color and granite. I fell absolutely in love with the granite when I saw it. My husband teases me I always pick the most expensive thing out and it held true here because I literally picked out their most expensive stone. In my defense- 1. It’s perfect. It has whole gemstone looking pieces throughout 😍and 2. I was willing to pick a lower priced stone for the bathrooms to balance it out. Guess which granite we have? 👐🏼My negotiations made sense I guess! These pictures are of our counter top templates laid out on the slabs the way we want. (We asked to come back in after the template was done to do this.) Granite has natural variation so selecting your actual cuts is a way to help ensure you get the beauty of the stone you picked! A 3″ square sample doesn’t do justice or show the true granite patterns of an 8′ slab. 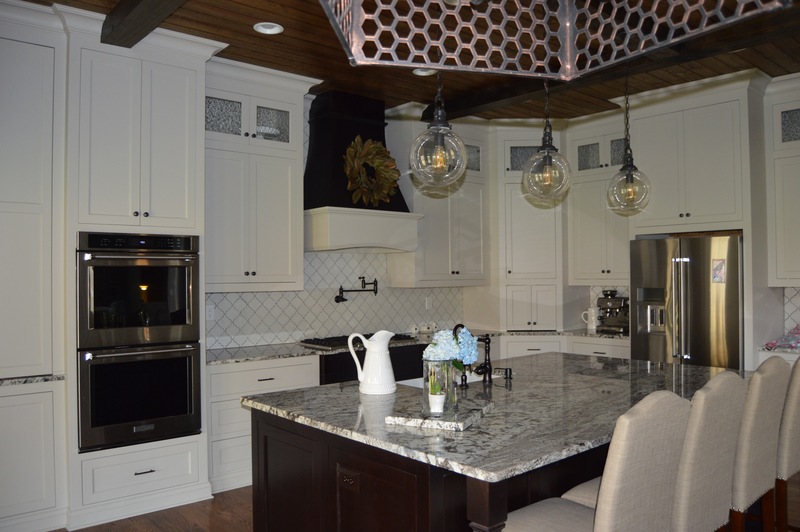 We used table legs on our island and on our cooktop to add some more detail. Backsplash- Villa Heirloom Linen Arabesque Porcelain Mosaic- I don’t think they carry our exact tile anymore but Floor & Decor has similar options- linked here.